At the PHC Stadium, the PHC Zebras needed extra time to defeat the North Village Rams 2 – 1. Daren Usher gave the PHC Zebras the lead in the 28th minute when he scored from close range, the North Village Rams missed the opportunity to draw level when Pierre Smith missed a penalty minutes before the break. The North Village Rams would get on the board in the 61st minute when Tareeko Wilson scored from the penalty spot, neither team would score for the remainder of the game sending the match into extra time. In the extra time period Cecoy Robinson would score with a right footed shot to give the PHC Zebras the lead and the win. The Dandy Town Hornets would defeat the Paget Lions 4 – 0 at the St. John’s Field. Kwonde Lathan would give the Dandy Town Hornets the lead in the 24th minute and then two minutes later Michael Parsons scored to double the lead. Angelo Simmons would make it 3 – 0 to the Dandy Town Hornets in the 35th minute and they took that score to the break. The only goal of the second half came in the 87th minute when Nizigh Spence found the back of the net. 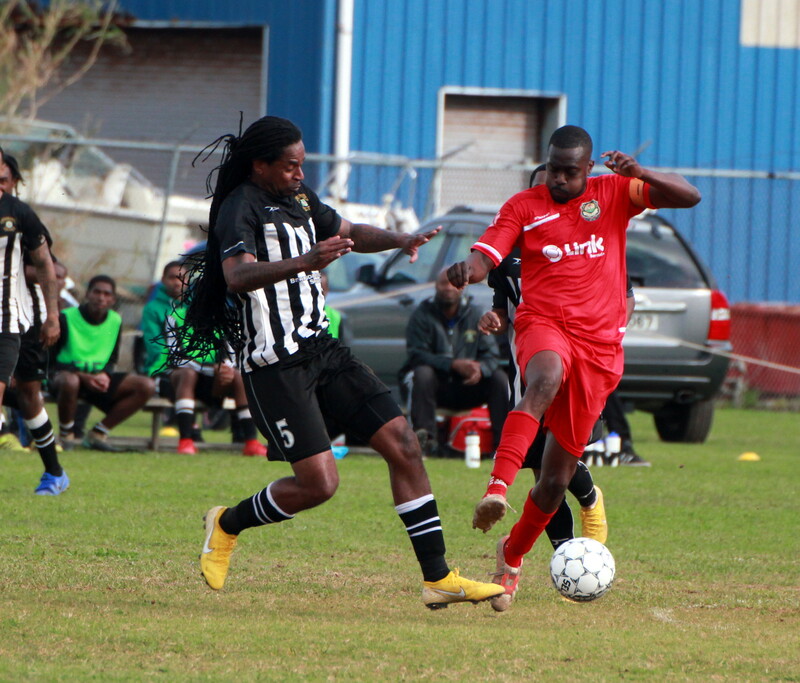 The Somerset Trojans travelled to the Wellington Oval and defeated Hamilton Parish 2 – 0. The Somerset Trojans would get a goal in the first half from D’Andre Wainwright and a second half strike from Zaire Smith in their win. At the Garrison Field, X-Road’s would defeat Wolves 3 – 0, Kyle Hamilton would score the only goal of the first half in the 41st minute to give X-Road’s the lead, Tymon Daniels would double the lead in the 62nd minute and then Undre Burgess would score the X-Road’s third goal in the 80th minute to advance in the Draw. The St. George’s Colts have advanced to the next round after they defeated the Devonshire Cougars 3 – 2 on Kicks from the Penalty Mark at the Wellington Oval. The match was held up in the first half due to an injury to St. George’s Colts player Jarreau Hayward who sustained a leg injury in a tackle for the ball. The match would see neither team find the back of the net in regulation time and again in Extra Time leaving the game to be decided with the kicks.